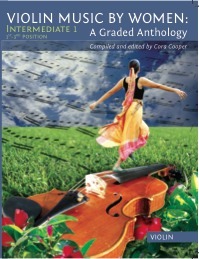 This volume corresponds to the ASTA String Syllabus grade 3, and contains pieces that use first, second and third positions (with occasional forays up to the half-string harmonic). Included are a variety of styles to develop vibrato as well as fast fingers. Upbow staccato, spiccato, chords, and artificial harmonics are included—students can stretch their technical muscles! Composers include Gail Ridgway Brown, Ethel Harraden Glover, Julia Klumpkey, Florence Morey, Mary O’Hara, Irma Seydel, and Grace White. ​Scroll down for sample sound files below. For more, and lots of other information, go to www.violinmusicbywomen.com! The music in this volume grows in musical and technical demands as your students grow with it! 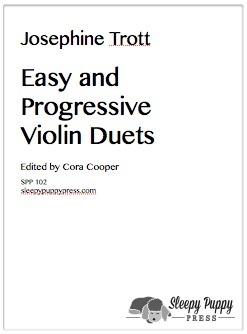 Using first through fifth positions (with the last piece pushing the envelope into sixth), works range from a Classical period sonata movement to a previously unpublished contemporary composition by Marga Richter, and then on to a wild mambo by young New Zealand composer Claire Scholes. The works correspond in difficulty with grade 4 in the ASTA String Syllabus. Other composers included are Ethel Barns, Ann Mounsey Bartholomew, Gena Branscombe, Rosalind Eillcott, Julia Klumpkey and Josephine Trott. 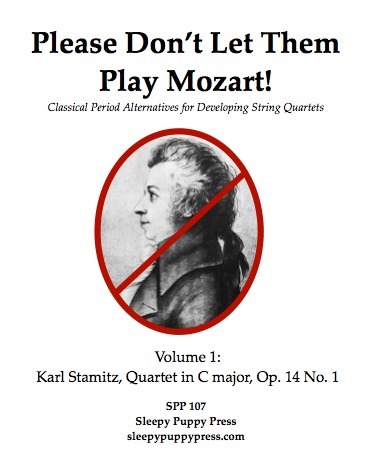 This series seeks to provide an alternative to the much-abused works of Mozart as played by developing string quartets. Pieces are technically more forthright, requiring less finesse while still offering an opportunity to learn characteristic phrasing and elements of bow control needed in Classical-period music. The Stamitz is fun to play and a crowd pleaser, with outer movements marked by driving rhythms and sharing of the melodic material. While the first violin uses third position, the other string parts are primarily in first position. A refreshing change for contest! This series seeks to provide an alternative to the much-abused works of Mozart as played by developing string quartets. 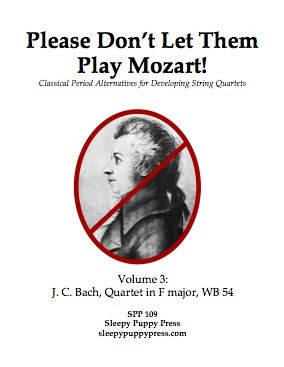 Pieces are technically more forthright, requiring less finesse while still offering an opportunity to learn characteristic phrasing and elements of bow control needed in Classical-period music. 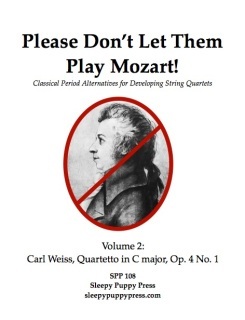 The Weiss is a two-movement quartet, typical of many Classical period pieces. 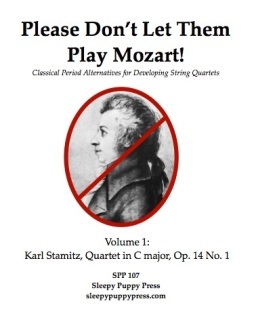 It can also be played as a flute quartet (flute plus string trio). As such, the second violin part actually requires as much or more skill than the first violin. The first movement passes themes around the quartet in contrapuntal entrances, so everyone gets part of the action. The second movement is an Andantino in which, again, everyone shares the spotlight. This is a charming and attractive quartet! Ms. Trott was a popular and influential violin teacher and composer during the early twentieth century. 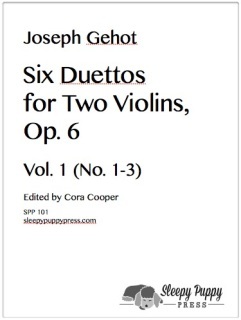 These fun, first-position duets were composed by Trott as part of her out-of-print book Melodious Foundation Studies. The duets progress in difficulty. Each duet is paired with selected technical material from the same book, adapted and edited by Cora Cooper to create “etudes” relating to each duet. Some more sophisticated techniques addressed in these works are syncopation, up- and down-bow staccato, harmonics, fourth-finger extensions, double stops, left-hand pizzicato, and ornaments.